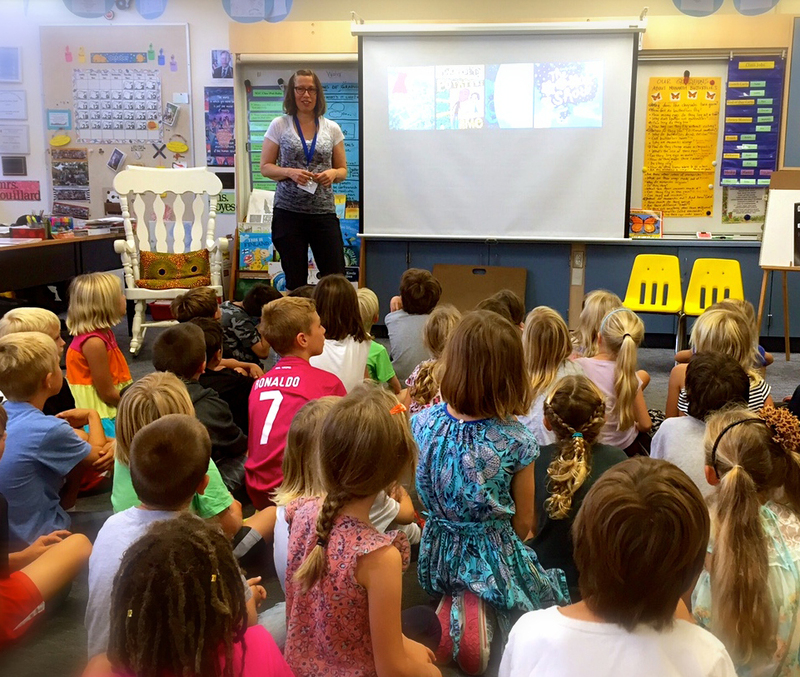 During my California visit, I met up with Weeds Find a Way writer Cindy Jenson-Elliott at Cardiff School, where she co-teaches an elementary class. Cindy and the students built a garden at the school: sometimes they spot grey whales swimming in ocean a stone’s throw from the playground. I got to talk to Cindy’s students about writing and illustrating books. And I got to do some drawing! Thanks to Cindy, Ms. Boyesen and Ms. Douillard for sharing your class at the school-by-the-sea. On September 26, we welcomed my Little Free Library to its new home! 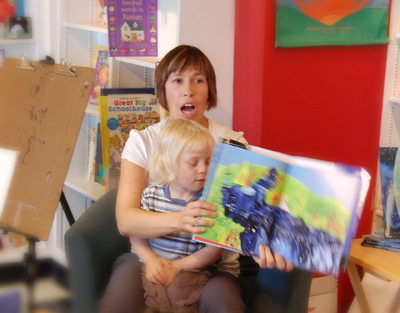 Visit the Capitol Hill Community Centre (21st Ave. NW near 15th St., Calgary) for a good read. Or find a Little Free Library near you: http://littlefreelibrary.org. Though my new book Weeds Find a Way won't be released until February 2014, I was happy to see it on School Library Journal's 100 Scope Notes blog! To preview Weeds plus a stack of other titles, check out the blog here. 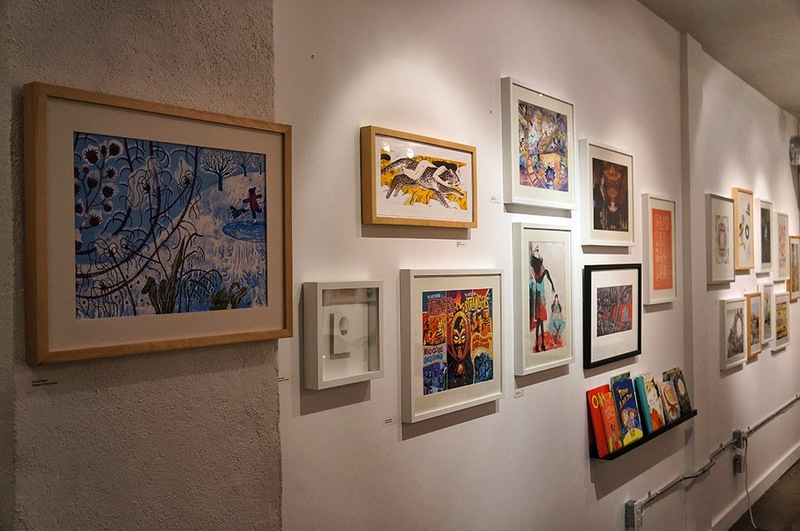 A September highlight for me was participating in the Alberta Illustration Awards Show, a celebration of local artists curated by the prolific and talented Mike Kerr. 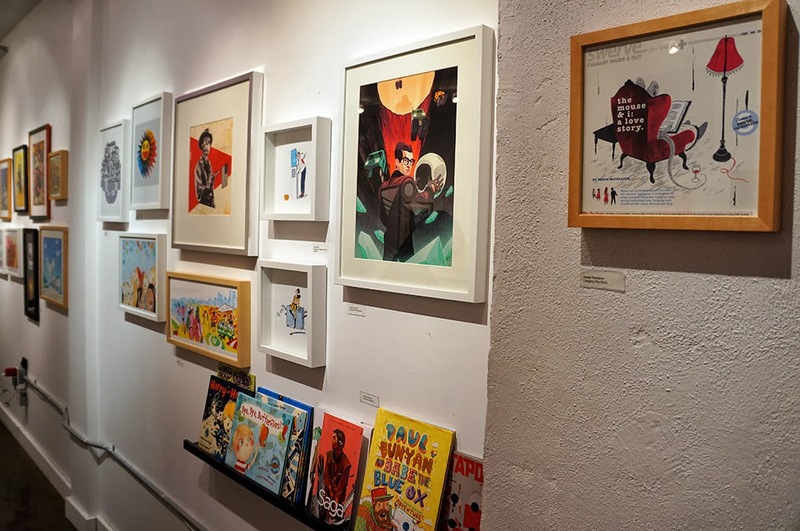 The opening night art show took place at Mike's (and Renata Liwska's) Randm Collective Studio, and kicks off a month of festivities including a children's book panel and a comic artist roundtable. The art show has now relocated to ACAD, where it will spend some time in the main hall. See more art and bios from the illustrators here. Thanks, Mike, for putting together an amazing lineup of art and activities! One month ago, Calgary suffered a devastating flood when 20 centimetres (8 inches) of torrential rain fell. That's more rain in two days than we usually get in a month on the pairie. Rivers swelled and burst their banks. 100,000 people were evacuated. Whole neighborhoods disappeared into lakes. Electrical backouts darkened city blocks. At the zoo, the hippos nearly escaped into the Bow River when floodwater rose above their pool walls. When the sun finally came out, Calgarians got to work, pumping, stripping, gutting, mopping and drying their mud-caked homes. I live with my family on a hill, so we escaped the flood unscathed. We donned rubber boots to join the hordes of volunteers who came to help the stricken neighborhoods. Cleanup seems well underway now, but you can see the high water traces. Those marks will be with us for a long time. For the last two weeks at Edmonton's Rio Terrace School, I worked with 350 students as artist-in-residence. To help mark Rio's 50th anniversary, each student produced a series of sketches culminating in a piece of art. What a talented group of kids! Here is some of the work we did together. 1. Owls (the Rio Terrace Mascot) as drawn by French and German Kindergarten students. 2. An Alphabet of Rio Terrace as drawn by French Grade 1 students. 3. Teachers asked me to share some tips on drawing bodies, so I showed everyone how to draw a stick skeleton to figure out body position. 4. I drew a stick skeleton, then I added clothes, skin and hair outlines to make an Action Self-Portrait. 5. Stick skeleton plus Action Self-Portrait sketches by German Grade 1/2 and French Grade 2. 6. Action Self-Portraits by German Grade 2 and French Grade 2. Students made self-portraits as they would look in the 60s, 70s, 80s and 90s. 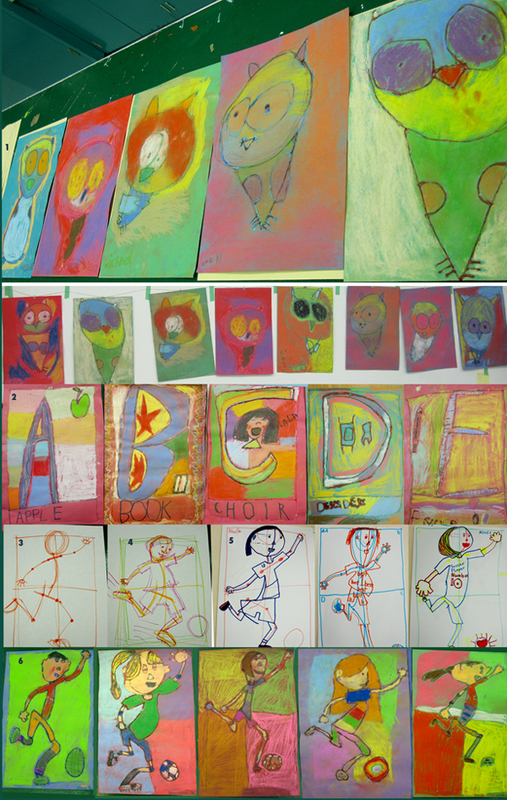 Pictures above and below by Rio Terrace Grades 3, 4, 5 and 6 students. Thank you to all the wonderful kids and grown-ups at Rio Terrace who made my stay so fun. Merci et Danke! Last winter, chickaDEE magazine asked me to write and illustrate a story for their Eco issue. "We want fiction with a green theme," the editor said. "Make it fun but not preachy." I brainstormed ideas with grade five, six and seven students from Edmonton's Story Avenue writing workshop. Kids developed characters to use in their own story plots - zombies, robots, ninjas and more. Their good ideas made me think of the perfect protagonists for my story - worms! Check out the September issue of chickaDEE magazine to see what I wrote and drew. Thanks, Story Avenue kids! See your story credit in print in chickaDEE's September 2012 issue. 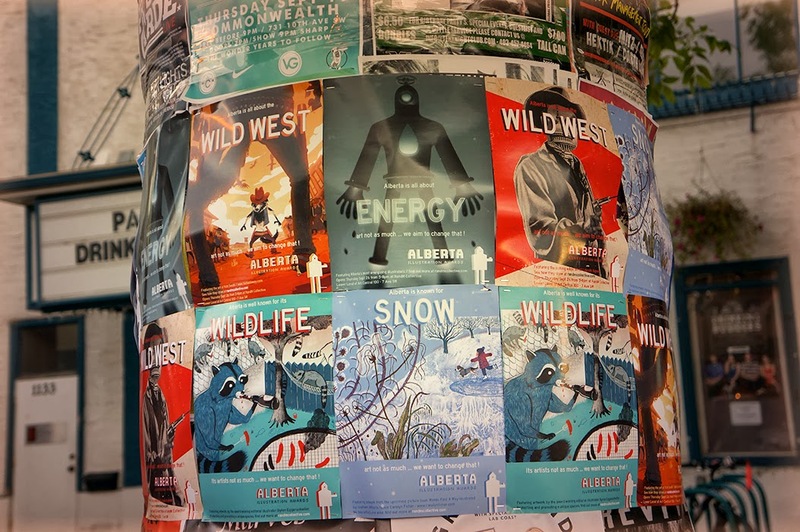 For more information about Story Avenue, contact the Young Alberta Book Society. When I was growing up on the farm, we would occasionally leave some fields unplanted over the summer. The earth would rest, the moisture in the soil would increase, and the crop would yield a bigger harvest the next time it was planted. This practice is called summerfallow. You know how farmers harvest day and night before winter hits? While I've been away from the blog this summer, I've been working like a farmer to finish the pictures for a new book, Weeds Find a Way. I submitted final art on Friday at 5pm. Whew! Now for a break - at least until the editor's notes come back. Summer's over, and in the back of my mind new ideas are sprouting. So now I'm ready to break out my sketchbook. Sketching bee, anyone? The illustrations for Good Night, World earned a place in the 3x3 Illustration Annual Competition. Yippee! The awards book will be issued in January 2012: see more at www.3x3mag.com. We had so much fun at the Good Night, World launch party! After we read the book, we drew NEW good night books filled with all the ways we say good night. Thanks to Kathryn and Amy for helping, and to Sue Hill of Monkeyshines Bookstore for hosting. Big hugs to all of our new and old friends who were there. If you couldn't make it, I promise to bid you good night personally in sixteen languages the next time I see you. Buenas Noches and usiku mwema! You and any kids you know are invited to my Good Night, World launch party! I'll do a reading and signing, and then we'll have some treats. We'll break out some paper and crayons for kids to make a NEW book of their favorite ways to say good night. If we're still not ready for sleep (after all, it is a bedtime book) we can all go back to my house and jump on the trampoline. A box of shiny new books arrived on my doorstep! I finished the illustrations for Good Night, World in December, and it's finally printed and ready for sleepy children everywhere. 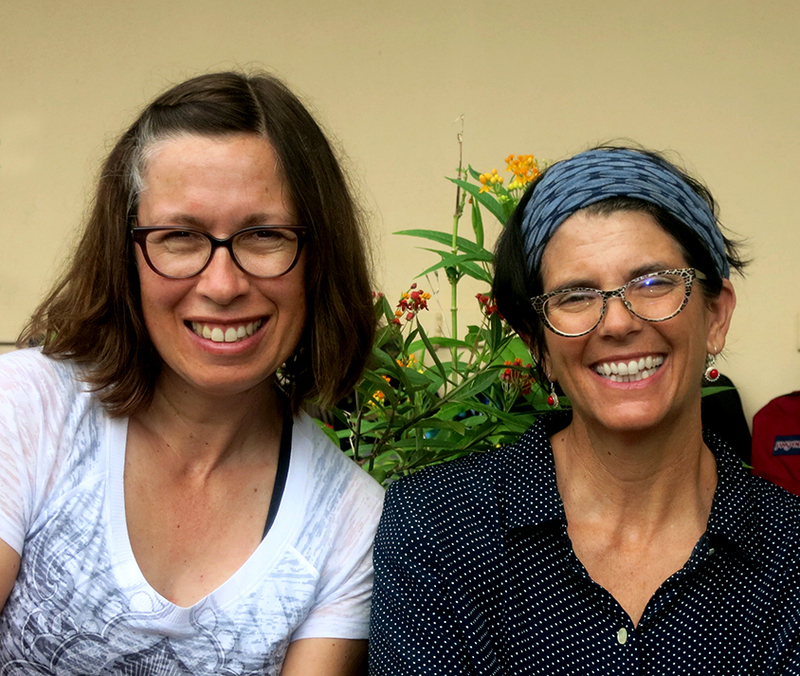 Jennifer Bertman interviewed me for her Creative Spaces blog. Scroll down to December 27, 2010 for a peek into my studio. Thanks, Jenn! The revisions to the revisions are done. The revisions to the revisions to the revisions are done. The revisions to the revisions to the revisions to the revisions are...well, you get the idea. Good Night, World is a bedtime story written by Willa Perlman with art by me, to be released by Beach Lane Books in summer 2011. I've been working frantically on it for many days...and nights. To celebrate, I'm going to take a nap. But first - can somebody read me a bedtime story?? My book TWO OLD POTATOES AND ME (written by John Coy) will be used in an ESL anthology. I wonder if the grade three students who read the book will notice that there's a potato with the face of Abraham Lincoln in the illustration above? Can you find it?